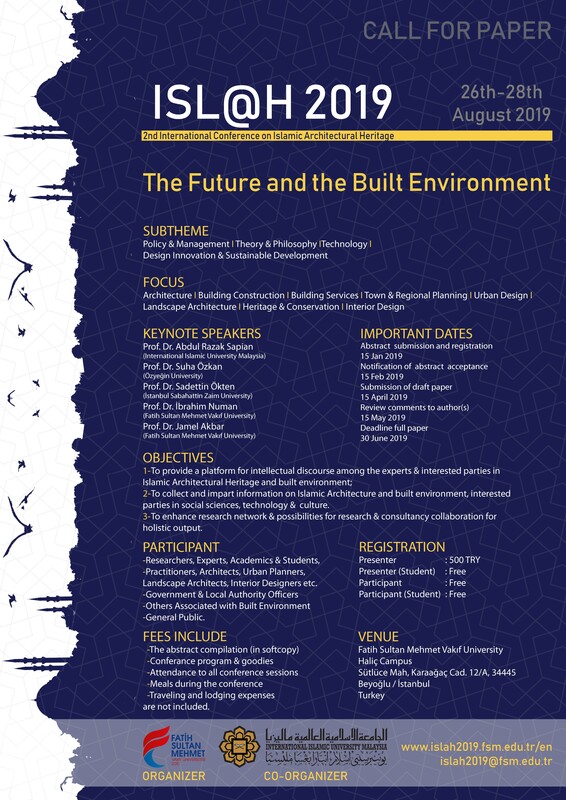 Faculty of Architecture and Design, Fatih Sultan Mehmet Vakıf University, Istanbul , in collaboration with Kulliyyah of Architecture and Environmental Design, International Islamic University Malaysia, is organizing the ISL@H 2019, 2nd International Conference on Islamic Architectural Heritage, to be held on 26th-28th August 2019 in Istanbul, Turkey. to collect and impart information on Islamic Architecture, the Muslim built environment, technology and culture for interested parties and also to enhance research network and possibilities for research and consultancy collaboration for holistic output. We are looking forward to meet our distinguished keynote speakers as well as participants, administrators, academicians, researchers, practitioners and specialized institutions from all over the world to share knowledge and experiences in the Islamic architectural heritage and built environment.